When George LeMieux was appointed three months ago to replace retiring U.S. Senator Mel Martinez, the 40-year-old former chief of staff to Gov. Charlie Crist vowed to focus on making government more efficient and effective. He has a strange way of going about it. 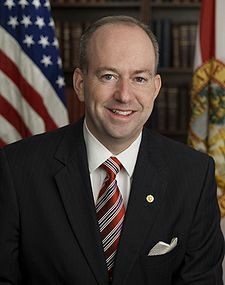 In his first foray into foreign affairs, Sen. LeMieux has placed a “hold” on the nomination of President Obama’s choice to become ambassador to Brazil, putting a freeze on the Senate confirmation process. This ensures that U.S. relations with the largest country in Latin America are neither efficient nor effective. “I feel like I have a role and a responsibility far greater than other senators do in terms of anything that deals with Latin America,” he said. If that’s the case, he would not stand in the way of this nomination. Brazil, the fifth most populous country in the world, is the most influential nation in our region, an economic powerhouse and Florida’s No. 1 trading partner overseas — by far. Sen. LeMieux has an obligation to either raise specific, serious questions about Mr. Shannon or allow the nomination to go forward. The U.S. relationship with Brazil is too important to be undermined by domestic political squabbles. I have seen this done in some overseas mission, usually for new consular officers just starting out on their first tours at a Consular Section. They go through what is often called the “Applicant for the Day” routine. The routine is part of section’s training program to acquaint new officers with the process that applicants go through when they apply for consular services. But this is the first time I’ve heard of an ambassador try out the routine and blog about it. Consular services are the aspect of our work that most directly impacts people’s lives. In responses to my blog, many of you have asked me several questions about our consular services. I wanted to see what “applicants” see. So I became an applicant for the day. I went through the security screen, which is similar to the screening at airports. I saw where people pay the required fees and where they are interviewed by the American consular officers. I even took part in a brief interview myself. Although the consular process is rigorous, the consular staff made every effort to be friendly, efficient, and thorough. 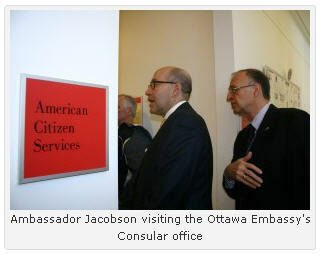 It’s not every day that you hear an ambassador pitch for the consular section, or visit it for that matter. Now if you can get all ambassadors to go through this routine from Albania to Zimbabwe, that would go a long way in making post leadership understand the challenging and demanding work done at the Section. And I don’t mean just the political ambassadors but also career appointees — even if career ambassadors have once done their consular tours twenty years ago. The Wang computers, the microfiche, the Burroughs machine that they may remember from all those years are all things for the visa museum now. Continue reading the ambassador’s post here. A former State Department official and his wife have pleaded guilty to federal charges stemming from their roles in a 30-year conspiracy to provide classified U.S. national defense information to the Republic of Cuba. At a hearing before Judge Reggie B. Walton, defendant Walter Kendall Myers, 72, aka “Agent 202,” pleaded guilty to a three-count criminal information charging him with conspiracy to commit espionage and two counts of wire fraud. His wife, Gwendolyn Steingraber Myers, 71, aka “Agent 123,” and “Agent E-634,” pleaded guilty to a one-count criminal information charging her with conspiracy to gather and transmit national defense information. As part of his plea agreement, Kendall Myers has agreed to serve a life prison sentence and to cooperate fully with the United States regarding any criminal activity and intelligence activity by him or others. As part of her plea agreement, Gwendolyn Myers has agreed to serve a sentence of between six and seven and a half years in prison and to cooperate fully with the United States. Both defendants have agreed to the entry of a monetary judgment against them in the amount of $1,735,054. The assets that will be forfeited to the government towards satisfaction of that judgment include: an apartment in Washington, D.C., a 37-foot sailing yacht, a vehicle, and various bank and investment accounts. Kendall Myers began working at the State Department in 1977 as a contract instructor at the Department’s Foreign Service Institute (FSI) in Arlington, Va. After living briefly with Gwendolyn in South Dakota, he returned to Washington, D.C., and resumed employment as an instructor with FSI. From 1988 to 1999, in addition to his FSI duties, he performed work for the State Department’s Bureau of Intelligence and Research (INR). He later worked full-time at the INR and, from July 2001 until his retirement in October 2007, was a senior intelligence analyst for Europe in INR where he specialized on European matters and had daily access to classified information through computer databases and otherwise. He received a Top Secret security clearance in 1985 and, in 1999, his clearance was upgraded to Top Secret / SCI. Gwendolyn Myers moved to Washington, D.C., in 1980 and married Kendall Myers in May 1982. She later obtained employment with a local bank as an administrative analyst and later as a special assistant. Gwendolyn Myers was never granted a security clearance by the U.S. government. Read the whole thing here including the background of the case, the CuIS recruitment, and the undercover operation that lead to the couple’s arrest.